Spring is here and very much flourishing! Whilst we have been graced with some glorious sunshine so far this season, we have also seen the arrival of spring showers. 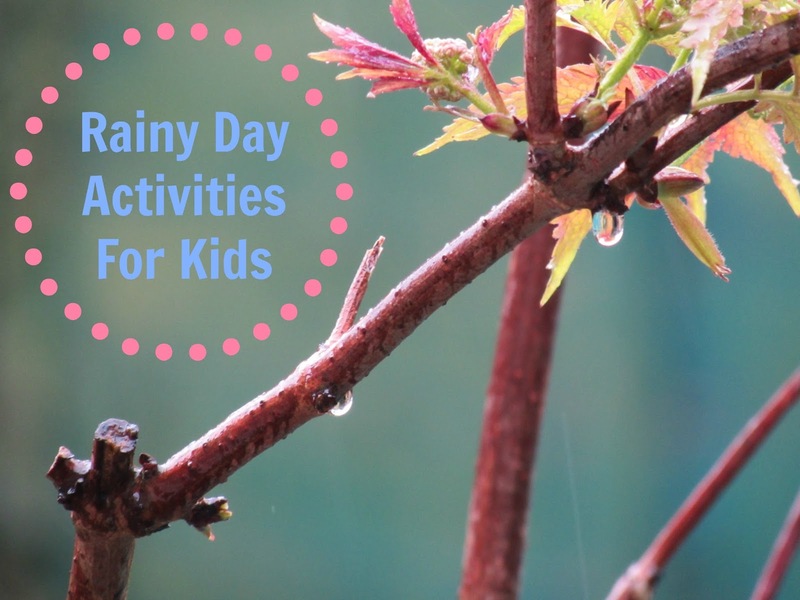 The grey and dreary days can feel a bit blah and repetitive, cooped up indoors playing with the same toys and games again and again, so today I thought I'd share a few activities you may not have thought about enjoying on a rainy day. When the rain is falling, one of the last things you want to do is head on out in it, however do just that. Embrace the rain. Pull on your raincoat and wellies and get on outside. Rainfall changes the landscape that surrounds us, and even a walk on a regular route can be a new sensory experience for children on a rainy day. Heading out to a local nature spot would be even better, with more nooks and crannies to explore as well as potential sightings of wildlife that thrive in the rain. The bigger, the better, right? Children love jumping in puddles, it can be messy but a lot of fun - I know my little one gets such joy out of the simple activity. Get involved with your child and join them; have a splash! As well as jumping in puddles, you can enjoy them by experimenting. See if your child can build a bridge across puddles from resources around you, or you could use simple items (household or nature) and see if they sink or float. Similarly, you can make boats at home using various materials, and have a competition to see whose boat floats/wins. Make a rain gauge using an old plastic bottle, or take the easy route and use a plastic jug that already has measurements on it, and leave it out in the rain so you can see just how much rain has fallen. You'd be surprised how much engagement you get from a child on this activity, wanting to check it every so often. This activity would be particularly great for slightly older children who are keen learners and love to experiment. There are two ways in which you can use the rain for the use of painting. The first involves using different coloured food colouring and splatter it on your paper. You then take this outside and let nature take over. The second way is pretty similar, however you can use regular paints and create more of a design. With both of these methods you'll end up with something different every time. Be sure to use paper that is a little thicker, cardstock even, and place a couple of stones on the corners of your paper - you don't want the artwork blowing away! 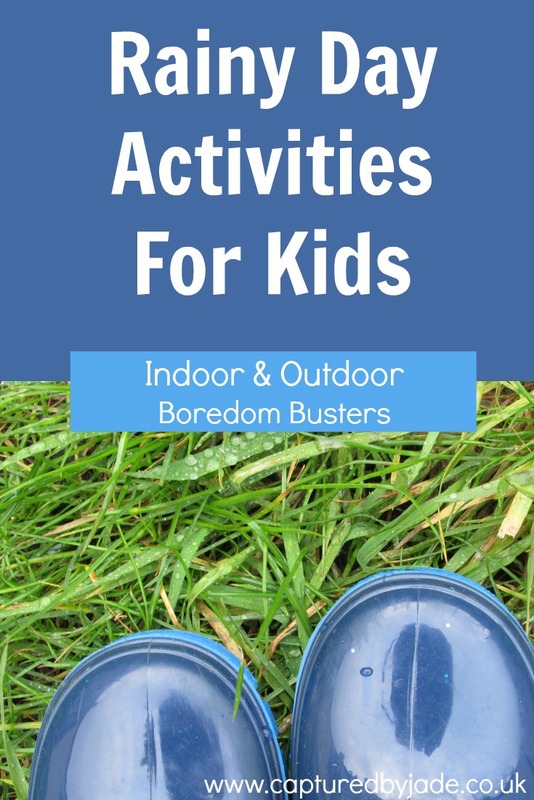 Getting outside in the rain isn't for everyone, not to mention there are certain downpours that you don't want to be caught out in, and for those instances I have a few indoor activities to share. Instead of moaning about the rain, step back and look at the beauty of it - think of all that rain does for nature and the land. Help your children to look at the beauty of rain also, and allow them to interpret rain through the use of arts and crafts. You can let them freestyle this themselves, however if they are slightly younger kids then some predetermined craft ideas may be better. One of the many great things about rain is the rainbows that follow... Sometimes we aren't able to experience a rainbow, so make your own! There are so many crafts and activities that involve rainbows, you'll be entertained for many a rainy day! Typically when you think of a scavenger hunt, it'll be outside and finding nature related items but it doesn't have to be. An indoor scavenger hunt is a great way to beat the boredom of a rainy day whilst also getting rid of some of that pent up energy your child may be harbouring. Why not compile a list of random household items for your little one to find, or use the alphabet with an item for each letter. You could also hide building blocks or puzzle pieces, with them coming together at the end when all pieces are found. Be creative! With plenty of time to kill, get in the kitchen and cook/bake something new and exciting with your child - this will especially go down a treat if you haven't allowed them to help out in the kitchen before. There are many benefits to cooking with your child including confidence building, the use of creativity and imagination, a sensory experience for children of a younger age, and for children of a slightly older age it can allow them to work on skills such as maths and science. Not to mention you're able to enjoy the fruits of your labour once finished - grab your food, a blanket (or two... or three...), a movie of choice and cosy down for an hour or so. WANT TO SAVE THIS POST FOR LATER? PIN ME! Not something you'd typically think about, more crafts indoors on a rainy day, but fun for sure. Lots of lovely ideas. I'd like to try out the rainbow! So many wonderful ways to create rainbows! ...I saw a group of boys playing in a huge mud puddle yesterday. I bet they were having a great time - simple things often keep children the happiest! A lot of fun & laughs to be had! Thanks for the great ideas. We're heading into winter here in SA and as we hate the cold we'll likely be indoors a lot. These type of lists always serve as good prompts. Who doesn't love bundling up and cocooning in the cold?! There is plenty of fun still to be had indoors. What kid doesn't love a big muddy puddle?! Haha! There is a lot of fun to be had in the kitchen! I think I have the only child who doesn't really enjoy crafts. Haha! Wellies and waterproofs is the way to go! Ah, I hope you enjoy it! I hope you enjoy the rain gauge if you do try that out. Thanks for hosting!! A great alternative to indoor rainy day crafts. Thanks for hosting!